We provide fast reliable 24/7 snow removal service to both commercial and residential customers in the Fairfield, County area. Prompt courteous service paying utmost attention to all of our customer’s safety, access and specific needs for each and every client. 24/7 Snow plowing coverage both commercial and residential properties. Clearing of snow from pedestrian walkways, steps and stairs. Environmentally friendly Ice removal products used for pet sensitive areas and delicate stone surfaces. Sand/Salt applications to driveways and parking areas. We provide many services to help you get your life and home back on track. Storm damaged tree and limb removal, Pumping of basements, Silt and sand removal, Applications of totally natural compounds to help neutralize the exposure and the effects of salt water flooding and salt spray to trees, ornamental shrubs and lawn areas along our battered shore line. A new disease for the Connecticut landscapes and most of New England is the Boxwood Blight. This is shaping up to be a real challenge for all us as we all seem to have Boxwoods of some kind planted in our landscapes. This fast spreading disease “cylindrocladium pseudonaviculatum” is also taking host on Pachysandra and there is no real one time cure as it is all so new. The most important things we can do is provide good horticultural practices in keeping plant areas free of debris and good sanitation of all pruning equipment. The warm mild winter of this year has put our landscape plants into a bit of confusion. Early spring bulbs in full bloom, daffodils getting bigger by the day, azaleas buds taking form, even the Iris are forging they’re way through the soft earth in some sunny locations. Well we all took a hard hit from hurricane Irene, days with out power, roads blocked , melted ice cream in the freezer and damages to properties everywhere. Maybe now is a good time to re-evaluate your property’s landscape to prevent future damage to the already exquisite beauty that you hold. With proper horticultural practices and planing of replacement ornamental trees and shrubs which are more tolerant of the times we are seeing, will give you a more care free and lasting environment that can only exist, through proper planing. Give us a call, it doesn’t hurt to ask… it’s still free. We still do not charge for stupid questions! Fall is by far the best time to get your grass seeds growing, cool nights and still warm soil tempetures makes them want to sprout n shout and grow fast . With good seed /soil contact you can achive excelent results combined with proper fertilization. Most people feel that if they ROTO-TILL their yard and seed it is the answer to a fresh start. Wrong. By tilling the soil you have just dug up weed seeds that have been sleeping for a long time. Come spring you’ll have weeds you never seen before. Through proper airetion , vertical slice seeding and fertilization those dead spots on your lawn from this past summer’s weather of heat and no rain, can be a thing of the past. Your lawn will recover in no time given proper care. Give us a call we would be happy to help. Curb appeal can happen in many ways, shapes, or forms, it can be a lavish driveway entrance with bright colorful flowers and shrubbery to border it. A walkway or garden bed bordered with cobble stone which seems to go on forever adorned by a manicured lawn with well maintained landscape plantings and trees tend to capture that appealing look. Whether you just moved here to beautiful Fairfield County or you are a life long resident of the area looking to add some pizazz from your street view, we are here to help you achieve that goal. Let our skill and experience help you in rejuvenating your properties looks and appearance in a affordable manner through, proper horticultural maintenance procedures to your existing landscape or to the redesign of it’ using the present plants with the addition of other accents to create a more alluring definition to the setting and to the eye. We can help you make it happen. We all savor the fresh flavor and enjoy the rewards of growing a fresh organic crop of vegetables in your own back yard. Imagine walking out to your patio to pick fresh snap peas, arugula and chives for your dinner’s salad or how about a mouth watering tomato for your family cook out. Let us work together to make this happen, whether you have a acre of land or just a tiny corner of a patio, balcony or roof top, we can help you enjoy your favorite culinary herbs and vegetables all with in a walking distance from your kitchen. You don’t need a lot of space to do this it can be as simple as a clay pot, whiskey barrel or elevated plant bed. With proper set up and simple care you can be enjoying the bounties of your own private garden , worry free of where your fresh vegetables and herbs came from and what chemicals have been use on them. Let us help you build your dream garden in to a reality no matter how big. We offer fall pick up and delivery in spring of your favorite annual, tropical or exotic plants. 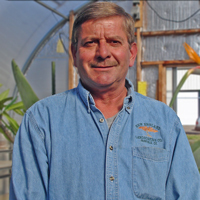 Let your favorite annuals or exotics have a winter’s vacation in our wood pellet fuel heated greenhouse. Environmentally friendly conditions for your plants stay during the winter months provided with all organic care. We provide total care of your Exotic plants offering re-potting, root pruning along with structural pruning to provide spectacular foliage and blossoms for your summers enjoyment.